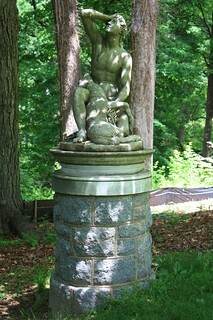 Statue "Grief of Cyporissus" on the grounds of the former National Park Seminary in Forest Glen, MD. Also called "Oh God, I Missed the Train!" by the students, since it was near the footbridge and if you could see the train to Washington as you started across, it was already too late to catch it.